When it comes to providing comfort, we take pride in providing quality service. Air conditioning is not just about cooling in the summer months but heating in the winter months. Don’t forget about the quality of the air you breathe. Studies show the air in your home can be more polluted than outdoor air. The filters you use in your unit can make a BIG difference. When was the last time you had someone look at you home air conditioning system? Maybe it’s time to let the experts suggest what’s right for you and your family. 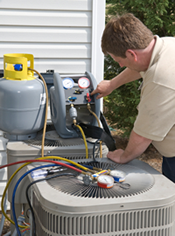 Air Conditioning Service – We service all makes and models. Our trucks are fully stocked with wide variety of replacement parts. If you need a special part, we do our best to get those parts in as quickly as possible. Count on us to provide friendly technicians, who are looking for the best solution to your problem. We always provide options when appropriate. From routine check-ups to emergency calls, you can count on us. Service Agreements – We provide an annual maintenance agreement on both residential and commercial air conditioning equipment. Manufacturers recommend servicing your equipment to maintain warranty at twice a year but no less than once to maintain warranty terms. This agreement meets all manufacturer requirements. We perform a full service of the equipment and detect potential problems before they happen. This service helps keep the unit running at peak efficiency. This policy helps prevent emergencies but is NOT an insurance policy. Call today to have your home air conditioning service! New Equipment & Installation – We handle Lennox, Trane and York brands. Our technicians will recommend optional prices and SEER (standard energy efficiency rating) depending on your home environment, budget, and concerns. We have a full stock of most 14-25 SEER units. The average house with a 1980 air conditioning system spends $900 per year in cooling costs. A new air conditioning system could save you approximately $300 per year. Let us know what your needs are and we’ll be happy to provide a solution. Filtration – Many people don’t even know they have a filter. Your air conditioning filter can cause dust problem, allergy problems, and cause the unit to run harder and longer. Most air conditioning problems are caused by poor filtration. We handle a variety of filters and keep up to date on the newest and most efficient filtration methods. Indoor Air Quality/ Duct Cleaning – If you have allergies, pets, headaches, burning eyes or throat, excessive dust in the house, or are using a standard disposable filter, you may suffer from indoor air pollution. Jim Rott is a certified Indoor Air Quality Hygienist with the Indoor Air Quality Association. We were one of the first companies to practice duct cleaning. Through education and experience, Jim Rott Home Improvements & Air Conditioning, Inc. has developed a means to clean and sanitize ductwork. The duct cleaning process includes a supply of high efficiency air filters to continue providing cleaner air. Call for a FREE indoor air quality inspection. Dryer Vent Cleaning – Does your dryer heat up and take longer than usual to dry the clothes? Have you noticed a lot of lint piling up behind the dryer? Lint build-up inside the dryer and the dryer vent can be a fire hazard. Cleaning the vent will increase the dryer’s efficiency and lower the utility costs. If you haven’t had your dryer vent cleaned in the last 3-7 years, maybe it’s time you called the experts! Designed & Hosted by Vetrol Data Systems, Inc.